The Algonquin Radio Observatory was inaugurated in 1959 at Traverse Lake in the Algonquin National Park in Ontario. It was created by the National Research Council of Canada for Canadian radio astronomers who needed a site in Ontario where radio interference would be minimal. The first director was Arthur Edwin Covington, Canada’s first radio astronomer. More than a decade earlier, in 1946, Covington had collected data on the Sun’s radio flux (the variations in its energy output at radio wavelengths) from a site in Ottawa, and again in 1947 from Goth Hill south of Ottawa. His work became of paramount importance when he demonstrated that the intensity of solar radiation was related to the Sun’s magnetic activity, which had (and still has) crucial implications for numerous human activities, such as communications systems and power lines. The Traverse Lake site in Algonquin National Park was selected for the Algonquin Radio Observatory due to its relative isolation from manmade interference. 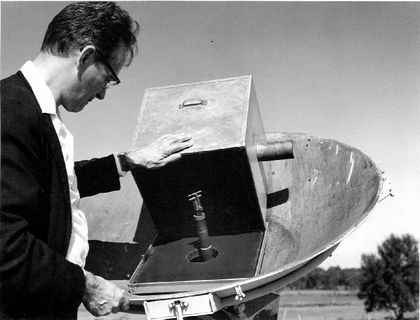 Covington installed a parabolic mirror with a diameter of 1.83 metres in 1960 and began moving his equipment from Goth Hill in 1962. The radio telescopes operated continuously at a wavelength of 10.7 centimetres, which is an ideal wavelength for monitoring solar activity due to the Sun’s particular chemical composition. In 1966, an array consisting of 32 parabolic antennas, each 3 metres in diameter, was added to the observatory. The goal was to refine the measurements from other radio telescopes by scanning the Sun’s surface every noon at a wavelength of 10.7 centimetres. Covington had begun the construction of a giant parabolic antenna measuring 46 metres across back in 1959, and it was finally completed in 1966 as one of the largest and most sensitive radio telescopes in the world. Operating at a wavelength of 2 centimetres, it was used to study galactic and extragalactic objects that emit radio waves, such as quasars. In 1968, the 46-metre radio telescope was used in conjunction with the 26-metre instrument at the Dominion Radio Astrophysical Observatory of Penticton, British Columbia, to simulate the resolution of a giant 3,074-kilometre radio telescope (the physical distance separating the two instruments). It was the first successful long distance interferometry experiment ever conducted. The goal of the experiment was to discern a source of radio waves with great precision. Very large antennas are necessary to precisely determine the position of radio sources because radio waves have much larger wavelengths than visible light waves, and because the detection of any object in space depends largely on the size of the observation instrument (that is, its lenses, mirrors or radio antennas). The 1970’s marked a time of increased collaboration between the Algonquin Observatory radio astronomers and the researchers at the Herzberg Institute of Astrophysics. Many new complex chemical compounds were identified for the first time in interstellar gas clouds thanks to the collaborative effort. 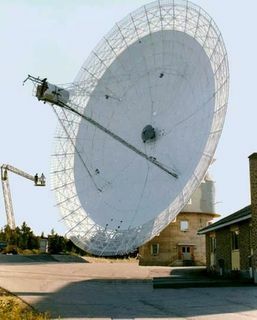 After planning to resurface the 46-metre radio telescope so that it could operate at wavelengths as small as 3 millimetres, the National Research Council of Canada decided instead to close the Algonquin Observatory in 1987 and purchase a 25% share in the new James-Clerk-Maxwell Observatory, which would include a radio telescope that could operate at 0.3 to 2 millimetres. 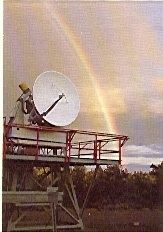 In 1990, the work of collecting data on the Sun?s radio flux moved to the Dominion Radio Astrophysical Observatory in Penticton, British Columbia. Despite lowered budgets, the antenna remained active as part of a continental network of antennas that precisely measures movements of the North American tectonic plate. Since 2008, the observatory has been operated by Thoth Technology who provide geodetic and deep space network services utilizing the 46 m antenna. The site is also accessible for education and outdoor activites.